sakurasound | (Ensemble Stars Event) Transform! Cinderella's Grand Stage! Kuro: ‘cuse me~. Are you here, Boss? Keito: Oh, it’s you, Kiryuu. As you can see I'm preoccupied, but I can hear you out. Tell me briefly what happened. Kuro: And I’m wondering what Akatsuki’s gonna do. If we’re gonna participate we gotta make a decision about our performance. Keito: Of course, Akatsuki will be participating. The entire school is excited about it. Keito: Plus, the ‘School Festival’ is an important event, on par with a S1 rank DreamFes event. Kuro: Alright. So, we gotta think up a performance. Keito: I apologize. I had been so busy with student council duties, I’ve had no time to think of anything. My own personal circumstances are causing trouble for Akatsuki as well. Kuro: Don't worry ‘bout it. Neither me nor Kanzaki have any complaints. The student council is also important to you, Boss. 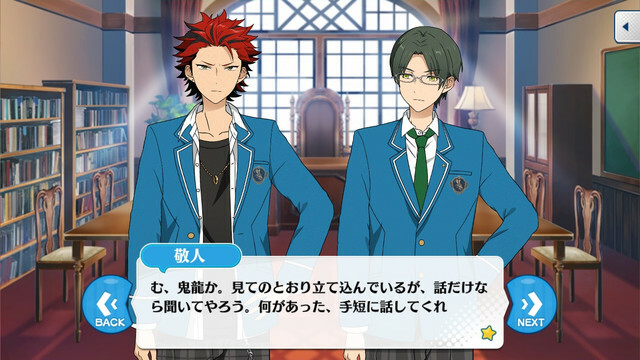 Keito: Is that so...the more responsibilities the student council has during the school festival, the more student council work will inevitably take up all my time during the days leading up it. Keito: Do something that requires as little pre-planning as possible. Kuro: Most idol course students would be doing a concert, so by choosing a different course instead, our performance might get picked. Kuro: But no one knows how it’ll turn out. If you’re short of people in the student council, you can rope us into helping out. Kuro: So, wouldn’t it be okay for Akatsuki to not participate? Kuro: The ‘School Festival’ might be a large scale event, but it's not a battle for superiority like Dreamfes is. Kuro: It wouldn't hurt Akatsuki’s reputation if we don't participate. There’s no need to force ourselves to participate, is there? Keito: I’d like to avoid that if possible. Even though we are not as strong as we were before, it would be a demerit to the School Festival if one of the strongest units, Akatsuki, was absent. Keito: It's important to participate in these kind of things. Kuro: Haha, got it ♪ So, we just gotta have a performance with all three of us Akatsuki members. Keito: ‘Something good’... that worries me but honestly, that’s a great help. I'll let you decide on the theme for our performance. Can I count on you? Kuro: Yeah, I’ve got nothing to work on right now. But in return, no complaints. I might think of something brimming with testosterone for our performance. Keito: Y, yes. I would rather you spare me from anything eccentric. But, I'm the one who said I'll leave it to you. I won't retract my statement. Mao: Um~ Vice President? Sorry to interrupt. I finished looking this over so can you double check this? Keito: Thank you. I can manage this on my own. Isara, go back to class. Mao: Got it, good work everyone~♪ If more work comes in, please contact me.